I love to go to water parks with my partner and the kids. I swear I feel like I am 12 years old again. When we go on vacation if its somewhere new, you can bet that I will always look to see if there is an amazing water park nearby. 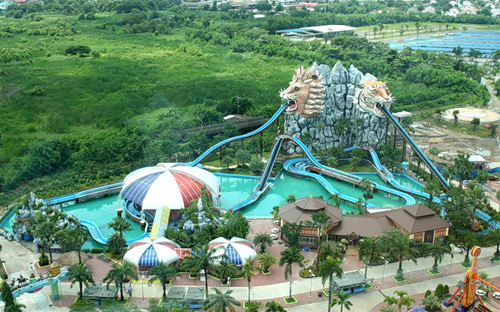 Today I have scoured the internet to find some of the best and craziest water parks in the world, water parks that if one day I do win the lottery I will go to! The main thing I want to experience here is there insane wave pool. Let me rephrase that their wave pools. They have two huge wave pools that are right next to each other. As well as this they have a water slide called the Dolphin Plunge where you go flying down a flume through and actual dolphin aquarium. As well as this there is a really nice beach area for when you want take breather from all the amazing water slides. Or if you are a parent you can relax here while the kids are running around all the water slides. This is the one water park on this list that I have been to! The main attraction here at this water park is the Tower Of Power water slide. This bad boy is 91 feet high. And it starts with a vertical drop that will shoot your though a shark filled aquarium. This slide is just flat out amazing and me and the kids must have went on it ten times! And for when you are wiped out there is a lazy river you can relax in. 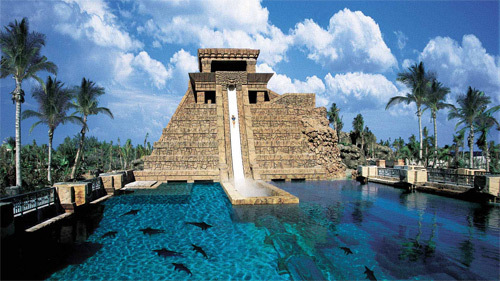 Aquaventure is in the record books as it has the widest water slide in the entire world! As well as this they have other cool stuff like a crazy long river ride and an awesome zip line that you can go on as well. 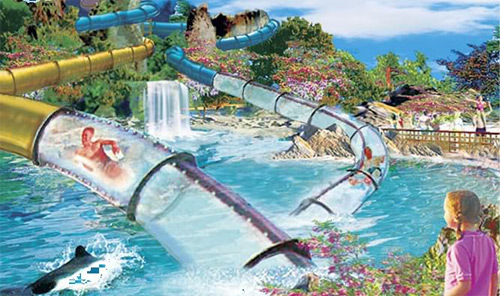 The water park is home to some insane water roller coasters for you to go on and there is also a nice beach and a shark lagoon also. So if you have some serious money and find yourself in Dubai then this is a place you need to check out. Austria is more than just the birthplace of Arnold Schwarzenegger. Here at Area 47 you have a fantastic water park and a sort of outdoor adventure area as well. But we are here to talk about the water park. 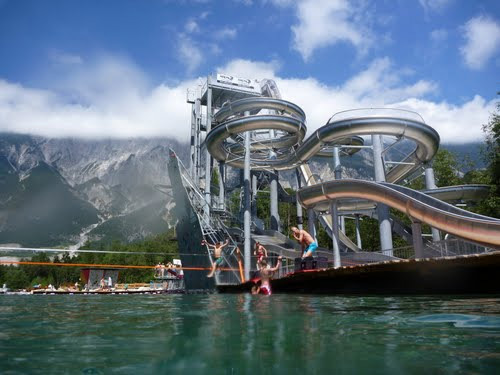 They have some really fast water slides for you to have a great time on, but there are some other neat attractions such as a huge diving tower that is so large more than a few people have made the walk of shame back down from it and there is also a crazy fast hydro speed slide. 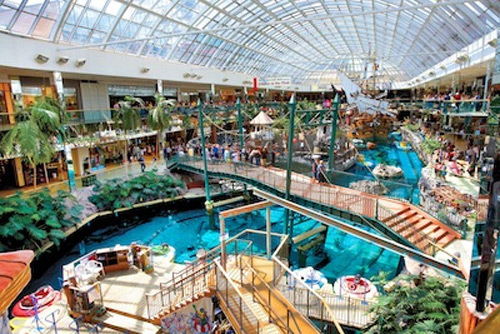 World Waterpark is the second largest indoor water park in the world and it is home to the world’s largest indoor wave pool, this place may be indoors, but it’s huge! There are a ton of great water slides for patrons of all bravery levels. But one thing that I really want to try and as I write this I think I may add it to my bucket list, is the bungee jump you can do over the wave pool! 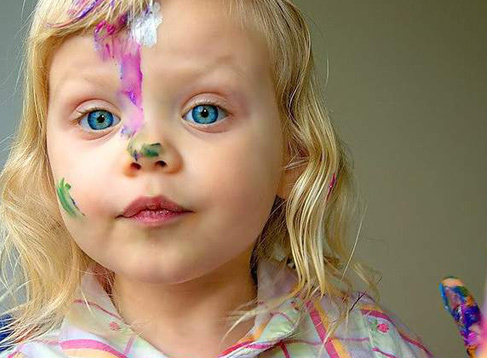 You might also be interested in this related article: The Best Theme Parks In The USA!